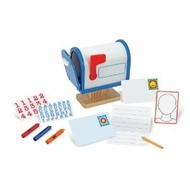 Your little one will feel like a big kid playing post office! Parents get their money's worth with Melissa and Doug toys. The sturdy wood components, vibrant colors, and attention to detail make Melissa and Doug's imagination-inspiring toys treasures that last for years. Pretend play at it's best!